Occasionally I pick up healthy multigrain and seeds breads at various markets and bakeries. The density of these loaves is perpetually disappointing. Although I bake with yeast for many years now, tackling home made multigrain and seeds breads has been on my to do list for awhile. This particular recipe yields such a light and airy loaf that I can see pairing it perfectly at any meal during the day. A toasted slice of multigrain oatmeal with a homemade jam or marmalade in the morning, or a freshly baked slice with a vibrant yolk fried egg for dinner at night, or paired with avocado and alfalfa sprouts or arugula on a picnic lunch. You might have already caught my previous Marbled Rye Bread and Cinnamon Buns in this collaboration series with Red Star Yeast. I was browsing around the internet, mostly watching bread forming techniques, in French, which I don't understand, but from intonation and body language I could comprehend the essence of the tips and techniques. Fortunately, Red Star Yeast has a series of How to Bake Videos with useful tips and sound advice. Watch these videos and check out Red Star Yeast on the Food Network Unwrapped, a fascinating episode. Check out the original recipe link below for comparison's sake. I like to keep my dough super moist so I didn't need as much flour. I also used larger baking loaf pans, 9 1/4 X 5 1/2 X 2 3/4, as they were the ones I had in my cupboards. The dough rose beautifully and filled up all the nooks and crannies of the pan. 1. In small bowl, dissolve 1 tsp sugar in warm water. Stir in Active Dry Yeast; let stand for 10 minutes, or until foamy. 2. In a mixer bowl, combine remaining sugar, boiling water, rolled oats, cracked wheat, oil and salt; let stand for 20 minutes. Stir in yeast mixture, flax seeds, sunflower seeds and whisk the eggs in with an egg beater. 3. With a rubber spatula, incorporate in the whole wheat flour and 2 cups of bread flour. Attach the hook attachment of the mixer and knead on low setting for 7-10 minutes or until smooth and elastic, adding more flour if necessary. 4. Lightly grease the mixer bowl, turning the dough to coat all over. Cover with plastic wrap; let rise in warm draft-free place for 1 hour. 5. Grease two 8 x 4-inch (1.5 L) loaf pans; set aside. 6. Punch down dough; turn out onto lightly floured surface. Divide dough in half; knead each portion into ball. Using rolling pin, gently roll each into rectangle the length of loaf pan. Roll up into cylinder; pinch along bottom to seal. Fold each end of loaf in and pinch to seal. Place into prepared pans. Cover and let rise in warm draft-free place for about 1 hour or until doubled in bulk. 7. 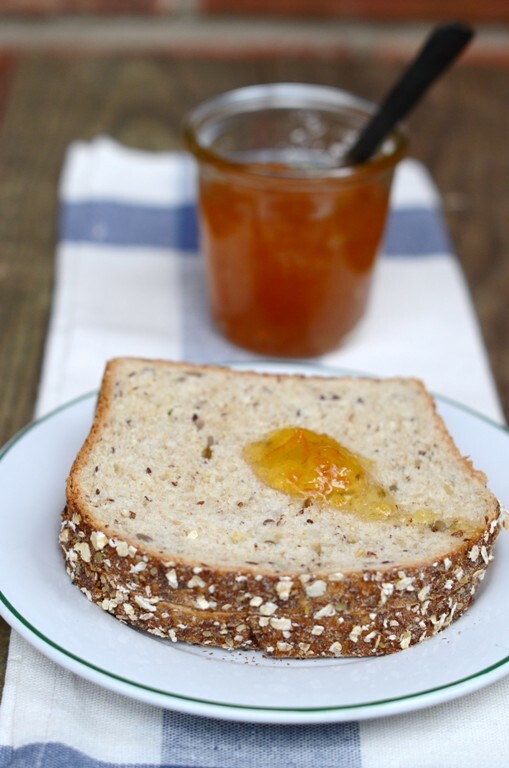 Brush egg over loaves, sprinkle with topping of rolled oats and flax seeds. Bake in center of 375°F (190°C) oven for about 30-35 minutes or until loaves are golden brown and sound hollow when tapped on bottom. Remove from pans; let cool on racks. This looks like such a lovely loaf! I'm a big fan of multigrain breads, but I also have the same problem with how dense they are... not that I don't like a hearty bread sometimes, but it's nice to have light and fluffy for a change, too. Can't wait to try this one out! TY Isabelle, let me know when you do. I do like hearty from time to time but not a hockey puck as Jeanette put it so eloquently below:). That's a mean lookin' loaf of bread! Perfect texture and the crust looks wonderful! TY Bri. I know, right?! Was pleasantly surprised as it was my first try at a multigrain. You see Alan we are finding common ground, maybe not okra and bacon but we bond over carbs! :)& yep thx adding butter into the mix! I know loved that it called for both in the loaf and as part of the topping. Thx baby pandi. Gorgeous looking Bread Shulie... everything is perfect about this bread... Yumm:) Beautifully captured. TY so much. I always wonder if I captured it and happy that you feel so. Means a lot! What a gorgeous loaf shulie! I absolutely love the rye bread that you baked and this is one step ahead. Love that you added flax seeds to it. I know, right?! I also loved that it didn't call for sesame seeds. A nice change since I use them all the time. Thanky Fifi!! Shulie, what a beautiful rise you got on this healthy whole grain bread. I know what you mean by dense whole grain breads from the market, how disappointing. 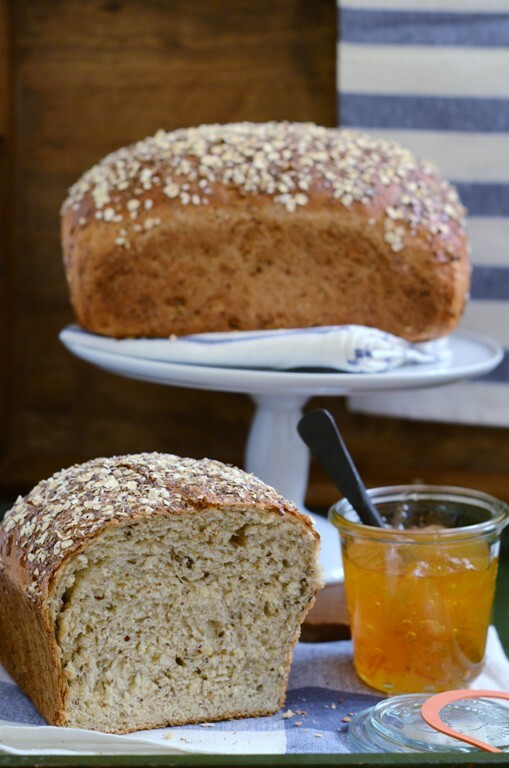 But, with your recipe, no more hockey puck whole grain breads! Jeanette! Thank you, I could not have articulated it better 'hockey puck' lol. Just brilliant! What a beautiful bread! I love such healthy loaves. TY Rosa. You are always so kind!! Oh Shulie, you bread queen, you! This is beautiful bread we should all be eating. ahahaha Maureen. I feel like royalty now! :) & true isn't it?! Thx for visiting! I feel the same way about the whole grain breads I buy...I think I will follow your lead and just bake my own. Yours looks amazing, Shulie! Please do and let me know how it turns out Lizzy. Love my fellow bakers!! TY. Gorgeous texture and no doubt flavorful. You are the master of bread making, or is it mistress? It's funny; ever since I injured my finger I've been yearning to bake bread. I was working on a focaccia recipe when I got hurt and can't wait to get back to it. I am really fond of multigrain bread, especially toasted. Yous looks wonderful. Aww I bet your focaccia is wonderful. I baked it in the past but am sure yours is up a notch! Happy to see you are doing better with your finger and soon back to fulfilling your baking cravings! I would love that perfect slice of gorgeous bread right now with jam and a hot cup of coffee. It turned out beautiful, Shulie and lovely photos. I so needed a cup of coffee this morning and I would happily have brought few slices of this bread. Ran out of coffee & when went to Starbucks they didn't make it right and I didn't feel like complaining :( Wish you lived closer! Your bread looks so perfect! Color, texture, everything about it has my name all over it. Nicely done! After my epic fail on bread baking this week (bread machine disaster!) I'm eager to give this one a go! I love grains and seeds in breads, and agree, sometimes the ones at the stores and bakeries are as heavy as a baby! Gorgeous loaf you have here Shulie! ahahaha Nelly 'heavy as a baby' & you don't even have now. yet! Just wait for the diapers! lol Thx so much sweets you always brighten my day & space here! I agree with you on the density part and I usually add whole wheat chappathi/ roti flour along with white flour while baking. This recipe sounds a winner; will try out. Aww TY Shri, do tell me how did it turn out. I want a slice with jam! Very nice loaf! TY Karriann!! Happy cooking and baking to you as well!! This bread looks so delicious (as does everything you make!). Happy weekend! Aww TY means a lot. Have a great weekend!! Looks lovely, Shulie! 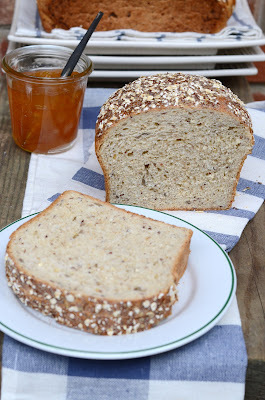 I also make a Multigrain Oatmeal Bread for the farmers market, and sometimes just for us. It's different than this one, but also not as dense as the "artisan" loaves. I'd take a slice of yours, any day of the week! aww Flaming means a lot especially since you bake another version and sell it at the Farmer's Market. How wonderful!! I wonder if I find your recipe on your site?? Such a beautiful loaf. I like a super moist dough too. Beautiful loaf of bread! Such a nice crumb to it. 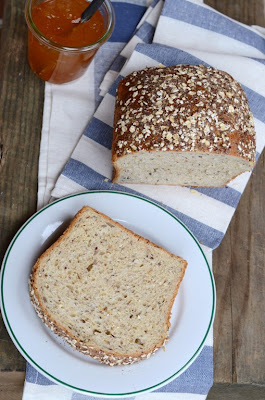 i need to buy some quick cooking oats and give this bread a try. 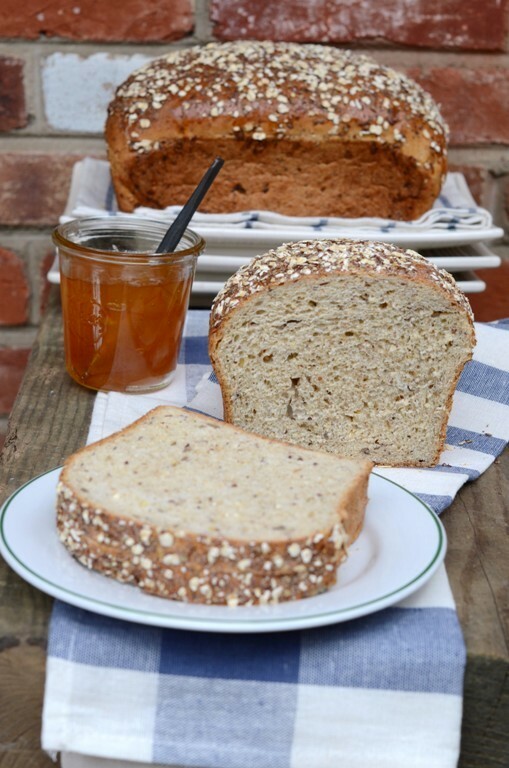 i love making multi-grain breads and i'm intrigued by your light version. Oh this is such a great looking loaf...just beautiful and so tasty! I love your photos!!! This sounds amazing. I need to take time to make homemade bread more often. Yum! Do you know I love to bake bread...it makes me so excited to see such a gorgeous looking loaf! Homemade bread makes me all warm inside! You have slowly become the bread queen! This looks wonderful. Shulie, this is absolutely perfect, bakery-quality bread! Wow! I'm going to watch those Red Star Yeast videos! Lovely loaf of bread & perfectly baked. 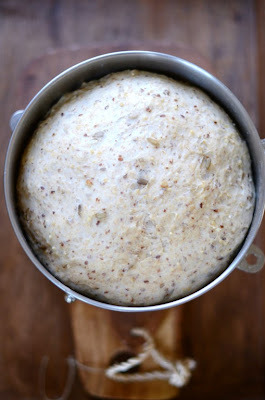 You know with my new found love of bread baking I am really going to have to make the...soon! How much flour did you use? 2 cups seemed enough. I'm afraid it won't work. Can't wait to see! Yes, Fannie, the directions at RSY say 'enough' but I just clarified it in my directions. Thanks for getting my attention to it. 2 cups bread flour and 1 cup whole wheat flour were enough indeed. Thanks again. 1) when you say " Roll up into cylinder; pinch along bottom to seal. Fold each end of loaf in and pinch to seal. "....what exactly does pinch mean here? 2) when you say cover the dough (after it is placed in the tins) is it to be an airtight cover with cling film or otherwise? This is my first time attempting to bake with yeast so I am guessing that these questions may seem a little obvious to the average poster here. On that matter if you could recommend any books or webpages for beginners I would really appreciate the help! Super excited for your baking with yeast debut. 1. Pinching means literally pinching the seams with your thumb and forefinger together. 2. You can cover the dough with a clean kitchen towel in a warm no draft area. A. How Baking Works by Figoni will explain baking everything. No recipes, but techniques. B. Jane Mason's All You Knead is Bread. ecipes with photographs, excellent baking advice, and homey tales. C. http://www.joepastry.com/ this blog, which will take you from Point A to Point Z and beyond. D. Artisan Bread in 5 Minutes a Day books by +Zoe Francois and Jeff Hertzberg. Since it is no-knead (and the recipes are great and always work) it will give the person time to understand the concept of yeast baking. Thanks Nelly, Cristina, Vivian, Christine and Jamie for the suggestions! 1. Baking Soda from Google + sais "I received my copy of Peter Reinhart's " artisan bread every day fast" this Tuesday. I think I am a convert:-)! For me these recpes work better than the 5 minutes a day book. Reinhart takes the same principle ( quick mix/knead one day, retard in the fridge overnight, bake the next day or up to 4 days later) to the next level. Baked only two recipes from it but those made me happier than the 5 minutes master recipe. ﻿"
2. 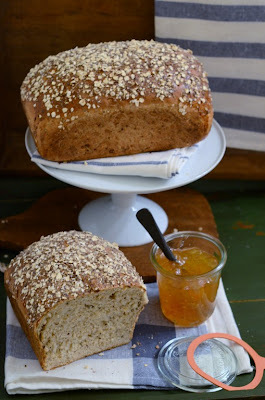 Paula from Google + said " I began baking bread with The Bread Bible, by Beth Hensperger. I can´t recommend her enough! It´s a great and quite simple book." "Peter rein hart, The Bread Baker's Apprentice: Mastering the Art of Extraordinary Bread is excellent book for a beigner, She can look at my blog http://www.zestysouthindiankitchen.com too, I make set by step photos in all bread baking .﻿"
I can imagine some homemade pate spread on your bread or some Hungarian salami. Food dream come true and I can eat that anytime of the day with some pickles. yum =D I can literally see myself with your bread at midnight for a snack, need to make this asap!